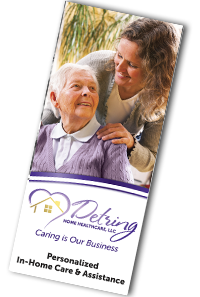 Detring Home Healthcare continually works for you or your loved one’s independent needs by providing primary caregivers for support, allowing the senior to stay in the home. We can provide minimum to extensive care, depending upon your needs. Whether you are alone or have a family, we work for your independence by providing qualified caregivers and support services. We look for caregivers who are compassionate and understand how to offer services that bring quality to life for you and your loved ones. We are a family-operated business, setting us apart from larger home healthcare companies. Learn more about our available services.